Tea good. House good. Worf pleased. A settlement of 11,000 people is destroyed but for one household. The crew of the Enterprise attempts to figure out why they were spared, while being chased around the system by an angry ship. Meanwhile, Troi experiences mental trauma as a song continues to play. Picard eventually figures out the ship (and song) are caused by the man on the surface who is an extremely powerful being. That being reveals himself, heals Troi, and admits to killing off an entire species because of what they did to the colony. Picard concludes the being is to be left alone. This is one of the more memorable episodes so far in TNG. It starts off very slowly, but eventually the seeds of mystery planted in the beginning come to fruition. The plot keeps viewers guessing throughout, but not in a way that is ever obvious. Yes, it’s clear that the evil ship has a connection to the couple, but viewers have to reason alongside Picard in order to try to figure it out. It’s a mystery which keeps viewers guessing until the end. It is unfortunate that the episode feels so slow. It’s not bad at all, but the whole thing just lacks the kind of pacing that the greatest episodes of TNG are able to muster. 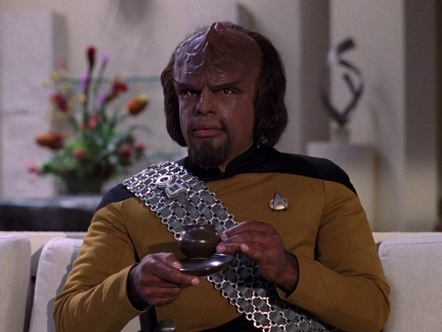 Worf’s “I like gall” line was great, but his “Good tea. Nice house.” one-off was better. He’s a great character so far for these one-liners, but I can’t wait to see him develop more as a character. Picard’s moralizing is interesting, and leads to a number of questions: why could not such a being be punished? ; how could this be seen in any way as justice (as Picard possibly implies)? ; is there a punishment which could be meted out upon a such a being? These and other questions spring to mind, but “The Survivors” leaves them unanswered at the end, allowing viewers to muse upon them as the Enterprise flies off to another adventure. 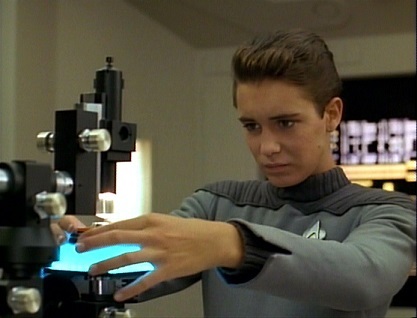 It doesn’t feel unsatisfying; rather, it calls for reflection in the way that the best episodes of TNG do. Overall, a very solid episode marred by a fairly slow pace. A Starfleet anthropology site is seen by the locals when a hologram projector fails, leading to the belief that Picard is deity. Troi is a captive and her life is in danger as the locals attempt to please their re-discovered belief in the “Overseer.” Ultimately, Picard reasons one of the proto-Vulcans into unbelief and convinces the rest that he is not a deity. They part ways, but have learned more about the broader universe. There is much to love in “Who watches…” First, I haven’t commented on the music in the series yet, but this episode had some pretty solid tracks. At some points they got overbearing/repetitive, but it is the first episode I actually noticed the music in, and it was a good thing overall. Second, the concept of Starfleet having little observation posts all over the place is compelling and interesting, and I remember my childhood wonder at the fact that they’d be there in the midst of discovering. Third, the overall plot is pretty solid. Unfortunately, the episode isn’t all great. The main difficulty is the constant theme of “religion is for idiots.” On a blog with the title “Eclectic Theist” it should be no surprise that I think this is bunk. Picard emphasized that getting beyond belief in deity was a major intellectual accomplishment, and I would agree that it is–when one is not believing rationally in the actual God. However, apart from the fact that it is very reasonable to believe in God, the whole episode seemingly relies upon the history of religions school which is largely bunk. That is, it seems to portray simplistic primitive religion (which the people of the planet are retreating towards) as an evolutionary step on a movement beyond totemism and finally into “enlightened” atheism. Now this history-of-religions is actually false, but it also makes for an episode which continues to operate on a kind of moralistic anti-theistic level which is just grating on the nerves. We can debate the finer points throughout, but that is for a different place (see linked posts). My point regarding this as an episode is that it simply destroys much of the appeal of the plot to have religion reduced to such simplicities that people instantly “devolve” into “primitive” religion when confronted with technology, and that this would seem just obviously true. It’s a weak plot point and, again, rams down our throat the notion that it is true throughout, despite having little empirical evidence and even a great amount of counter-evidence (see, for example, this book). Okay, I promise I’m getting off the high horse now. The episode has a solid premise and some genuine entertainment value. It’s just brought down by the points mentioned above, along with the difficulty of believing that the situation would in any way develop as it did. To think that a person could move from unbelief to casually choosing to attempt to murder others to please an alleged deity is tough to swallow (and speaks to the what I mentioned above). It makes for one of the episodes where you wonder about what could have been rather than what is actually presented. Sigmund Freud, Totemism, and the origin religion- Who cares about facts?– I discuss some difficulties with the alleged origin and development of religion from totemism to ever-increasing complexity of practice. This belief is commonly associated with Freud, but is there evidence for it? 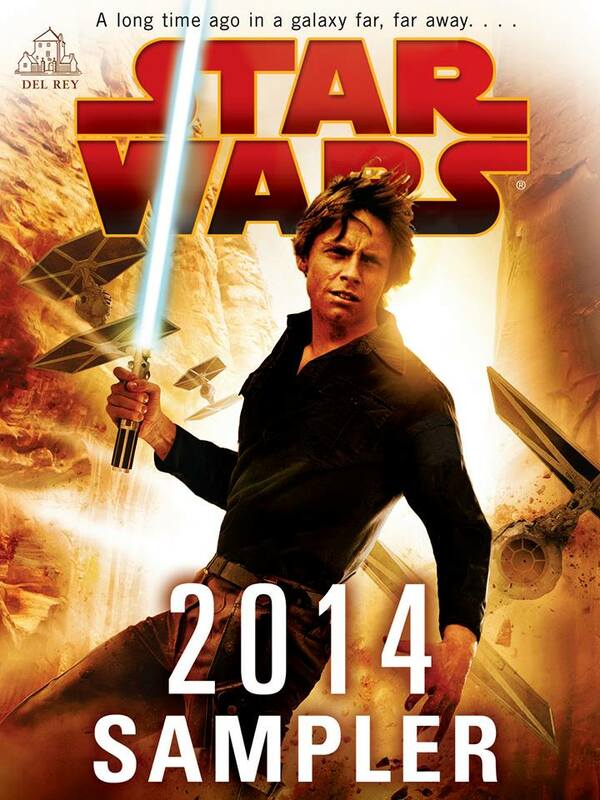 The new Star Wars canon books will start coming out in September. Recently, I discussed how a sampler was released (and it remains available free here) to survey four of these upcoming novels. I read through the sampler in its entirety and I would like to offer a brief thought on each of these samples. Each section starts with the publisher’s blurb. I found this one to be really quite intense. The story immediately grabbed me and the characters seemed really interesting. I liked the style and intensity. The blending of character development alongside immediate action was done well, and I think that can be quite hard to do. I really look forward to this one, which is surprising because I thought it would be the one I’d enjoy the least. I don’t think I’ll be able to watch the “Rebels” show until it comes out on DVD so I hope the book does well as a stand-alone. I expected to like this one the most because I think Tarkin is a character who could have a whole lot of awesome background development. However, I was surprised to find this one didn’t really grab me. I’ve enjoyed Luceno’s work in the Star Wars universe before so I’ll give some benefit of the doubt here and hope that Tarkin’s character carries the book more than he seemed to in this brief snippet. I think the main problem is the format, as I barely felt I had a chance to get the “feel” of Tarkin at all in the brief parts in which he was speaking apart from the action. Oh boy… I don’t know what to say about that one. I love Luke Skywalker. He remained one of my favorite characters throughout all the Expanded Universe novels, so I have a bit of a bias for him. That said, I’m not sure that this format will work for a Star Wars book. I did quite enjoy the sample, but it seemed like Luke spent a bit too much time explaining who other people were and what they were doing. Moreover, it seemed consciously self-referential in a way that undermined the genuine feel that first-person narratives need. I remain cautiously hopeful for this one, though. I enjoyed it, but I was also perhaps overly critical in my reading due to my attachment to the character. Honestly this was probably the least memorable of all the samples. I expect this one to be awesome, because, after all, it is about Vader. But really I was barely impacted at all by this sample. Hopefully it was just a poor selection, but I barely even remember what happened. Admittedly, part of that may have been that I was sick while reading it and probably read it around 4-5AM as I was trying to get tired again. Maybe I should re-read it! Anyway, those are my thoughts. I will probably pick up at least one of these in hardcover for posterity, so I look forward to engaging with this new go-round of the Star Wars universe. I really hope they’re good and although I remain really upset about the fall of the Expanded Universe, I think this will be a fun run. Did you read the sampler? Let me know your thoughts in the comments. I’d love to hear them. The Enterprise is ferrying a scientist with a pet project to a star that will only allow the study every 200 years or so. The ship has difficulties caused by nanomachines Wesley unwittingly released. Eventually, Data is able to communicate with the ever-evolving nanos and brings about a peace treaty. The science experiment(s) succeed. My enjoyment of this episode rapidly deteriorated as it got more and more absurd. The premise isn’t awful; runaway nanos (or other technology) seem like a legitimate threat, and the way it initially played out wasn’t bad. The problem is the amount of suspension of disbelief involved in thinking that some nanomachines programmed to aid in medicine were somehow able to evolve to eat computer parts and then manipulate them, then communicate, enter Data to communicate in English, and ultimately decide they wanted their own planet. Yeah, that happened! I mean I found this whole train just absurd. It doesn’t help that the scientist–Dr. Stubbs– was unbearably annoying. Frankly, I was on Troi’s side when she lectured the heck out of him. Also, where did Pulaski go? I get that Crusher is back–and I think Dr. Crusher is a strong character–but what explanation is there for where Pulaski went? She was just growing on me, too. The Wesley storyline was bearable, but it also makes me question, yet again, why there are no consequences for any characters. Wesley nearly killed everyone on the ship! Dr. Stubbs massacred a large portion of a sentient species (though I actually would have been on his side in this–they’re machines and also ridiculous!)! Yet they both walk away without any consequences. Anyway, the whole thing is too unbelievable for me. Decent premise, poor execution. Great special effects in this one, though! An alien race contacts the Enterprise with instructions to remove a human colony per their treaty with Starfleet. The evacuation would be impossible in the time allotted, but the aliens are unwilling to negotiate. Meanwhile, Data must convince the colonists to evacuate. Picard scours the treaty for a loophole, while Data ultimately goes angry-android on the colonists to show them the military might headed their way. Ultimately, Picard finds the loophole and all is saved. The juxtaposition of the developing drama between the situation on the planet with Data and Picard’s struggles to delay the destruction of the colony makes for a genuinely suspenseful episode at several points. The added dimension of factions developing on the planet also heightened the suspense. 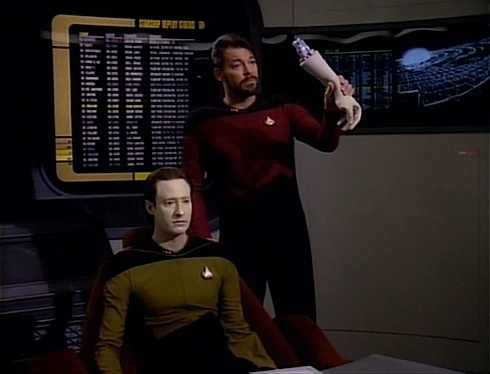 Ultimately, however, the episode was carried by Data, and it shows how strong his character has become in TNG at this point. First, the intro scene with his playing the violin (and Picard walking out to deal with the crisis) was a good opening to set up for the struggles with his (lack of) humanity later on. Then, the way the colonists rejected his advice merely because he was an android set up a nice obstacle for him to overcome. Later, his decision to follow the maxim that “actions speak louder than words” sets up an epic and cold-blooded scene in which Data mows down several guards and then attacks the aqueduct. Finally, the close with Picard arguing with Data to show that even in mimicry, he was making individualized choices created a compelling finish to close out the episode developing Data’s self-image. Again, set alongside what is a genuinely interesting main plot, with some awesome scenes from Picard, this episode really shines. Some fun with Geordi and O’Brien in the transporter gives just enough comic relief in between the serious parts to keep it going. Troi also gets a major nod as she comes up with an excellent analogy for the difficulties of communication, leading Picard into some head scratching which ultimately unleashes Picard’s passive aggressive fury as he checks for dust around the bridge of the Enterprise before allowing the aliens a reprieve. This is a fantastic episode with little to interfere with its superb storytelling. 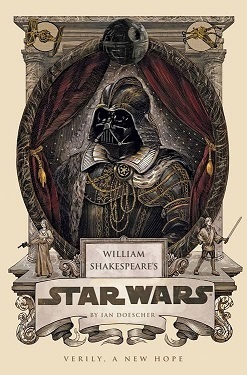 When I first saw William Shakespeare’s ‘Star Wars: Verily A New Hope’ by Ian Doescher, I was immediately intrigued. I’ve been a fan of Shakespeare for some time (I remember reading through Julius Caesar in fourth grade and going on to other plays from there), and of course I’ve also been a huge Star Wars fan for most of my life. What would a combination of the two bring? Luke: Hast thou no heart? She sentenc’d is to die! Han: My sentence is: ’tis better she than I. A slight malfunction o the weapons here. ‘Tis well, ’tis well. And thou? Art also well? It’s not just Han who gets great lines. R2D2 is portrayed as a droid masquerading as a simpleton to show that even the simple can make the Empire fall. C-3PO admits his reliance upon R2 in asides, while simultaneously ridiculing the little droid. Vader’s musings over his own place in the Galaxy are thoughtful and provide a better set up for the later stories in the series. The language remains Shakespearean, though I would note that it is hard to say anyone could equal the master playwright. Rather, Doescher doesn’t try to hard. He simply uses the same language, but clearly imports his own prose into the work which gives the book a feel of a Shakespearean drama without feeling contrived. Throughout the whole book, there remains a feel of genuine drama without ever being overdone. Moreover, the feel of Star Wars is also preserved perfectly. It blends wonderfully with the feel of Shakespeare in a concoction that makes one wonder why it hasn’t been done before. In short, the book is delightful. I would recommend it highly. Well, we’ve finished Season 2 of TNG, and I thought it would be fun to hand out some awards. I’ve decided to break it down into a couple categories. My wife, who has not seen the series before, will also be picking in these categories. J.W. : Lwaxana Troi. She ruins everything. Everything. Even cool fishmen’s attempts to assassinate her and the rest of a conference in “Manhunt.” Come back fishmen, you must save us! Beth: Guinan, because she’s consistently interesting and she still does things you don’t expect. J.W. : Data. He had the most development of any of the main characters, while also consistently delivering funny moments and boosting other characters alongside him. Beth: When Riker shuts off data in “The Measure of a Man,” not for being the best or happiest, but for being the most remarkable. J.W. : It would have to be when Riker turns Data off in the court scene in “The Measure of a Man,” followed by Data telling Riker that it had saved him. J.W. : The obvious pick is “Shades of Gray” because absolutely nothing happened. I’m going to give TNG a mulligan on that one (writer’s strike + out of budget) and instead pick “The Child” because there’s no excuse for that entire episode. Beth: The season finale, “Shades of Gray.” They get a bit of a pass for the woes/budget, but it was still just bad. J.W. : “The Measure of a Man” is one of the all time greatest episodes of any TV show I have seen. Beth: “Peak Performance” was just all-around good. J.W. : I’d give this season a C. There are several really great episodes, but also enough garbage in there to drag it down despite some all-time greats. Beth: C+, because most things were done pretty well but overall it seems like there is room for improvement. The Enterprise is set up for some war games to test her crew’s military prowess with a Starfleet observer on board. Riker gets to hand pick a crew to pilot a derelict ship to challenge Picard. He also gets wrecked by Kolrami in Stratagema. Riker picks the crew and sets up the ship with some surprises. After Data is also defeated by Kolrami in Stratagema and the In the middle of the simulated combat, the Ferengi show up and demand the “valuable” derelict. Picard pretends to blow it up and Worf makes a sensor shadow of a Starfleet warship and they flee. Then, in Data’s rematch he plays to draw and Kolrami leaves in frustration. Win? Kolrami is easy to hate, but I honestly appreciate him in some ways because he stuck to his character so well. There was no compromise there, and he only grudgingly offers a “favorable” report after Riker and Picard (and Worf!) manage to clear the Ferengi threat. The episode as a whole clearly reflects the whole crew’s abilities rather than purely on Riker’s ability to lead. Riker’s leadership is a valid starting point, but Geordi, Wesley, and Worf ultimately are the ones who save the day with their ingenuity (and cheating!). Both Troi and Pulaski’s interactions with Data brought up some good dialogue and thoughtful reflection: what would it be like to try to counsel a machine, after all? It’s a great episode that develops many characters in positive directions, something hard to do in 45 minutes. Data’s decision to play to draw at the end is a fitting conclusion for a really excellent and genuinely thoughtful episode of TNG. Riker gets attacked by an alien plant and his condition rapidly deteriorates. 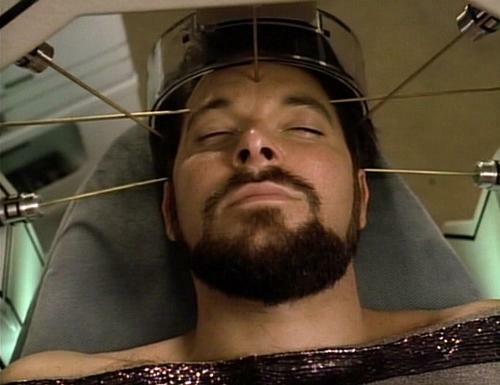 Finally, Pulaski tries to fight the illness by triggering a bunch of memories in Riker. The worse the memory, the better they fight the toxin. The worst memories are triggered. Riker recovers. I had forgotten this episode entirely, and for good reason. It’s entirely forgettable. After a rather interesting opening, we are treated to 30 minutes of flashbacks from earlier episodes while Pulaski and Troi give updates on Riker’s condition. Snore city. I read in my ultra-cool TNG book that apparently a writer’s strike had caused them to not have plot-lines set up for this point in the season, and “Q Who” had apparently drained funding. Thus, we get this. The unfortunate thing is that I feel as though Riker could have carried this episode on his own to at least the middling range. His one-liners to the medical staff are great, and the intro was compelling enough to make me think it would be a decent episode. But no, we have an episode that’s 85% flashbacks.